I was really delayed with my initial thoughts about this month's Love Lula Beauty Box, but you know what they say -- better late than never! We were away for several days when my delivery initially was made, so I did not actually open the April edition until Friday. Then I postponed writing this even further (you may have seen my apology and explanation on Twitter). But I have finally gotten down to business, and I am excited to share my feelings about this month's Love Lula box with all you eco-beauties! 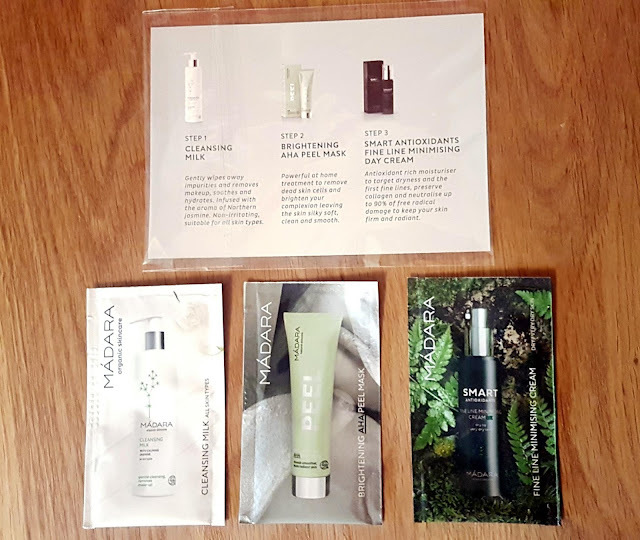 I was honestly happy with this box for a few reasons -- the products are overall pretty clean in terms of ingredients, I can (and probably will) use everything included, and while the brands are not necessarily new to be featured, I was pleased to see at least one newly released product. Overall, the total for this month's box was over £65, and there were two full sized products, two "discovery" size items, and three sample sachets. I still find the value of the Love Lula Beauty Box fantastic for the price paid, and while there is usually one item in each box that isn't suited to me, I wouldn't cancel this box as it is just too good in the long run. The April Love Lula box had a great variety to it I thought, with a handful of skin care goodies along with one full size makeup product. There is something for everyone in this collection, and it was definitely one not to miss (although if you did, don't worry -- Love Lula usually offer a free box with a shop purchase over £60 the following month!). First in the box were two "discovery" size products from Dr Botanicals: a 30ml sample of the Kale Superfood Nourishing Day Moisturizer and a 30ml sample of the Coffee Superfood Renewing Facial Exfoliator. This brand has been making the rounds through the subscription box world, so I was not totally surprised to see this included in this month's collection. One thing I am thankful for is that Dr Botanicals has at least been kind/savvy enough to provide different products for each of the subscription services they have been involved with in the last few months. I now have a good portion of their Apothecary Collection that was recently brought to Love Lula thanks to this marketing technique -- the Po Sleep Mask was part of the April edition of The Cruelty Free Beauty Box, and the Cr Mattifying Mask came in the April The Vegan Kind box. While I do not love DB as a brand (as I have expressed and explained several times now), I am impressed with this range. 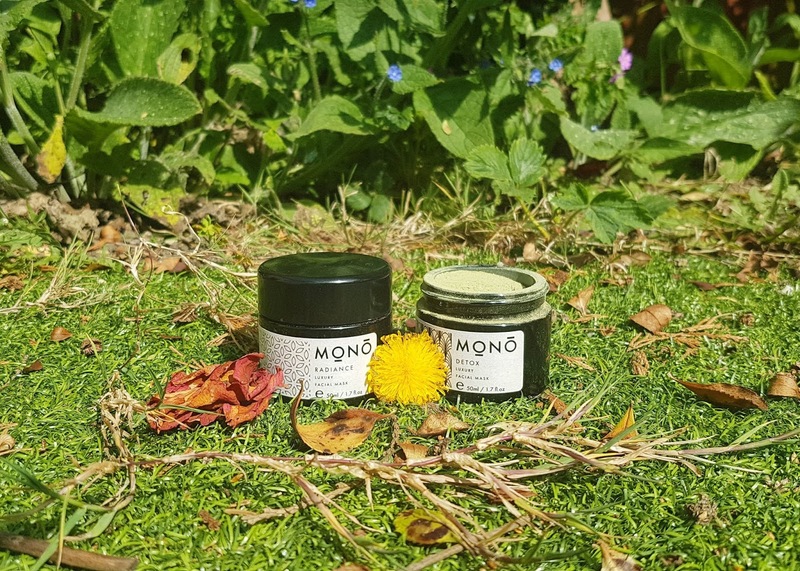 The ingredients are not too worrying, and each of the products have left my skin feeling incredibly soft and feeling healthy, smooth, and moisturized. The Kale moisturizer doesn't have a strong scent, and I wouldn't necessarily know that this superfood had anything to do with the product based on the smell if it were not for the name. The cream itself is not thick, but you can definitely feel it on your face for the first ten minutes or so (not oily per say, but richer than I was expecting). My face hasn't broken out, so I have to say so far so good - I do have several other moisturizers and face creams to use up before I should properly get into this tube, so I will do a full update when I finally get around to finishing this up! My experience with the coffee exfoliator has been great so far. I generally do not use physical exfoliating skincare products on my face, as I find them too harsh more often than not, but this one surprised me. Rather than being an actual coffee scrub, this is actually just coffee infused. The exfoliation comes from walnut shell powder, so it is not scratchy like I was expecting, but very gently buffs away dead skin cells and promotes healthy cell renewal. It felt highly nourishing as well thanks to all the added oils and butters, so I did not feel like my face was being overly-worked. 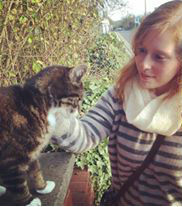 In fact, it felt so lovely afterwards, and I almost felt like I didn't need to finish with my usual serum. Kale Ingredients: Aqua (Water), Glycerin, Cetearyl Alcohol, Glyceryl Stearate SE, Butyrospermum Parkii (Shea) Butter, Caprylic/Capric Triglyceride, Prunus Amygdalus Dulcis (Sweet Almond) Oil, Acacia Decurrens/Jojoba/ Sunflower Seed Wax/Polyglyceryl-3 Esters, Crambe Abyssinica Seed Oil, Echium Plantagineum Seed Oil, Sodium Levulinate, Glyceryl Caprylate, Theobroma Cacao (Cocoa) Seed Butter, Sodium Anisate, Sodium Stearoyl Glutamate, Xanthan Gum, Phytic Acid, Levulinic Acid, Cellulose Gum, Chondrus Crispus (Carrageenan) Extract, Ceratonia Siliqua Gum, Sucrose, Brassica Oleracea Acephala Leaf Extract. Coffee Ingredients: Aqua (Water), Glycerin, Juglans Regia (Walnut) Shell Powder, Cetearyl Alcohol, Glyceryl Stearate SE, Caprylic/Capric Triglyceride, Prunus Amygdalus Dulcis (Sweet Almond) Oil, Coffea Arabica (Coffee) Seed Extract, Butyrospermum Parkii (Shea) Butter, Acacia Decurrens/Jojoba/Sunflower Seed Wax/ Polyglyceryl-3 Esters, Crambe Abyssinica Seed Oil, Echium Plantagineum Seed Oil, Sodium Levulinate, Glyceryl Caprylate, Theobroma Cacao (Cocoa) Seed Butter, Sodium Anisate, Sodium Stearoyl Glutamate, Xanthan Gum, Phytic Acid, Levulinic Acid, Cellulose Gum, Chondrus Crispus (Carrageenan) Extract, Ceratonia Siliqua Gum, Sucrose, Citric Acid. I have to start by saying, while I do genuinely rate Madara and I find their products exceptional in terms of quality, I am getting a little tired of seeing them month in month out. In fact, I have already been sent two of the sachet products in their full size (the Fine Line Minimizing Cream in July 2017 and the Peel Mask in April 2017). I have still not finished up either of these tubes, so wasn't too keen on also receiving sachets. Since I am trying my best to cut down on plastics and other unnecessary waste, getting single use (or 2-3 use) sachets is not ideal for me at this point. Actually, looking back through all my past reviews and Instagram posts I have realized I have been sent eight (mostly full sized) Madara items since I started subscribing in January last year. And while I love the quality and the value of these items, a lot of them are not suited to my skin and I end up passing them on to my partner or family/friends. That being said, this little try me pack is probably a great introduction for anyone who has not before experienced Madara. The cleansing milk is meant to be soothing due to the oat extract, and is said to be ideal for cleansing and removing makeup on all skin types, but especially dry. The AHA mask is a chemical exfoliation treatment designed to brighten skin, reduce appearance of fine lines, and unclog pores. This peel is not actually meant to be used daily according the full size product instructions, so I found it odd that the card made it sound like this should be used as part of a set routine with the other two items. It is a pretty mild treatment though. Step three in this trio is the Smart Antioxidants Fine Line Minimising Cream (Day). While not ideal for me at the moment, my partner uses this and the cream is seriously effective. It targets early signs of aging as well as fine lines by 'suppressing the formation of free radicals' and repairing existing damage. A handy little trio for anyone wanting to test out these products before purchasing the full sizes. 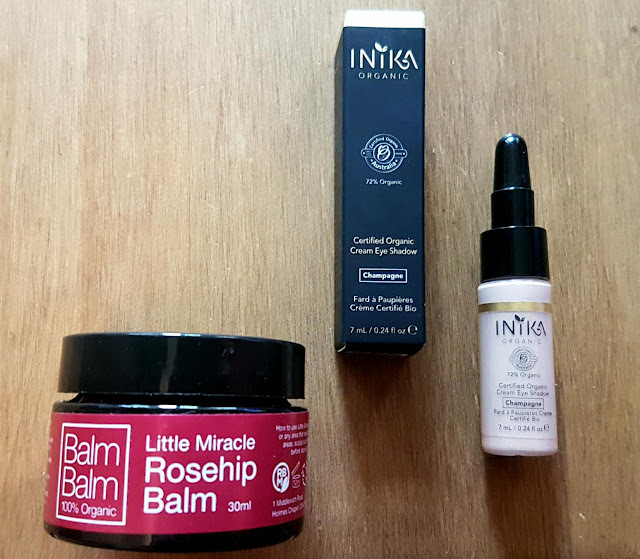 The products I was probably most excited to see were the new Little Miracle Rosehip Balm from Balm Balm and the Cream Eye Shadow from Inika. I prefer to use organic products, so I am always thrilled when these types of items are included in the monthly box. The balm smells just like Balm Balm's face oil of the same name, and I can already tell I am going to adore this product. I think I will mainly be using this as a treatment for the occasional dry patch of skin (I'm looking at you elbows! ), and possibly even as a pre-shower moisture boost that can melt off in the warm water. And, while I do not generally use cleansing balms, I think this one might actually be suitable for my skin if I can judge based on the face oil. My skin seems to love rosehip! I have used a lot of Inika Organic products in the past, and I even posted my very first makeup tutorial attempt using their makeup recently. I haven't, however, used any of their cream eyeshadows before so I was not sure what to expect. The bottle has a twist off top cap that then exposes a squeezy tube that the product then comes out of. I found it a little tricky to gauge just how much eye shadow was going to come out, but I think that will get easier with some practice. In terms of colour, I found this really subtle. And I mean REALLY subtle. It almost matches my natural eyelid, but adds just a touch of shimmer. To be fair, the description online says "A subtle illuminating shade to brighten and highlight your eye area. Perfect for adding a subtle sheen of colour for gorgeous eyes." I think I was just expecting a bit more actual colour of some sort. I found layering it on helped create a bit more of a noticeable effect, but to be honest I do like that this is so understated so I might just use this for a good natural glow. Inika: Aloe Barbadensis Leaf (Aloe Vera) Juice*, Mica, Cetearyl Olivate, Titanium Dioxide (CI 77891), Sorbitan Olivate, Glycerin, Aqua, Prunis Amygdalus Dulcis (Sweet Almond) Oil*, Persea Gratissima (Avocado) Oil*, Macadamia Integrifolia Seed Oil*, Simmondsia Chinensis (Jojoba) Seed Oil*, Cetearyl Alcohol, Butyrospermum Parkii (Shea) Butter*, Glycerin*, Sodium Levulinate, Glyceryl Caprylate, Tocopherol (Vitamin E), Sodium Anisate, Lactic Acid, Glycine Soja (Soybean) Oil, Tin Oxide, May Contain (+/-) Iron Oxides (CI 77491, CI 77492). While not the most exciting box, I was very pleased with the contents overall and have no complaints. The value is exceptional as always, the ingredients are all decent (no phenoxyethonal this month thank goodness! ), and I was happy to get a newly launched item from one of my go to brands, Balm Balm. If you want to join in on the Love Lula journey, you can subscribe to the recurring monthly box for just £13.95 including postage. And if you do so, not only will you get amazing full size products and deluxe samples every month, you will also get a 20% discount on the brands included every single month! Looks like an amazing box! I have been using a rosehip balm from another brand and it's lovely. 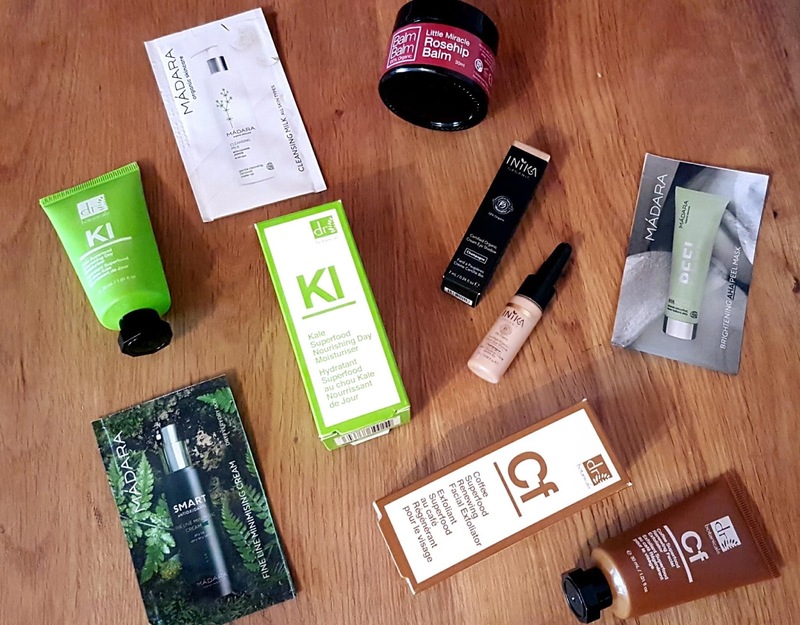 Looks like a great box I don't usually sign up for beauty boxes but I do like that this one has eco friendly brands. I like the sound of the rosehip balm. That's a great point about the sachets - it's really wasteful isn't it? I wonder if in future brands will consider offering samples in a different way. Some already do which I appreciate! I usually get tin or glass pots, or glass vials sometimes. I am really interested in trying Balm Balm Rosehip balm, it sounds good but I am just wondering how it compares to Wild Rose balm from NYR. I would be interested in reading a full review about it. I absolutely love Dr Botanicals! Their proucts are so good! What a lovely subscription box too! What a nice box! 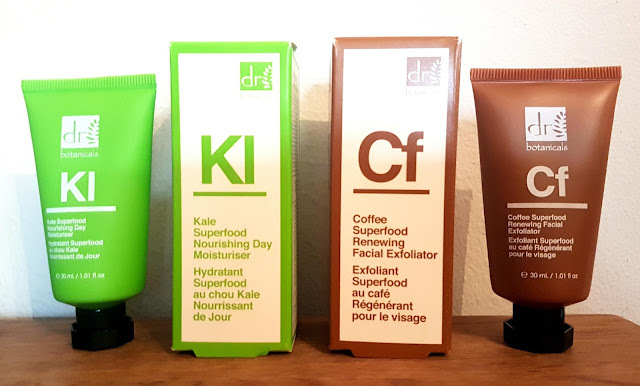 I recently tried Dr Botanicals charcoal facemask and love it so I really want to try more from the brand.